Six and a half years into Plan Bay Area, the San Francisco region's initiative to house new workers closer to their jobs is making about as much progress as an average commuter on a Bay Area freeway on a weekday morning ... that is to say, not much. Since the planning period started in January 2011, the nine-county Bay Area has added 558,900 new jobs but only permitted 127,820 new residential housing units. That adds up to 4.4 jobs per housing units. 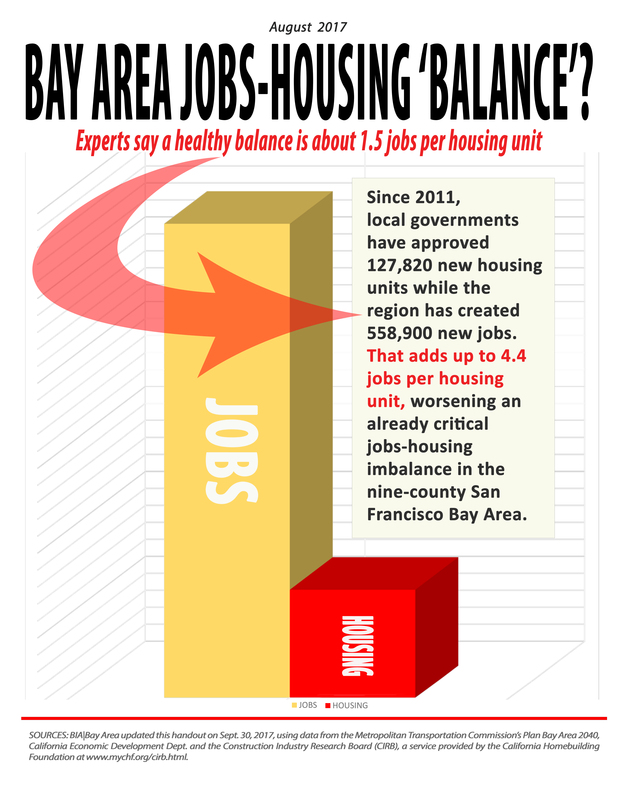 Experts say a healthy jobs-housing balance is substantially lower at 1.5 jobs per housing unit. Put another way, roughly a fifth into Plan Bay Area's 30-year timetable, the region has added almost half of its projected jobs but already has a 30 percent housing deficit. Unfortunately, nothing on the horizon suggests that the San Francisco Bay Area and its cities and counties are preparing to build housing at a pace that will start to correct this imbalance.